That’s right folks, chapbooks aren’t just for poetry any more! 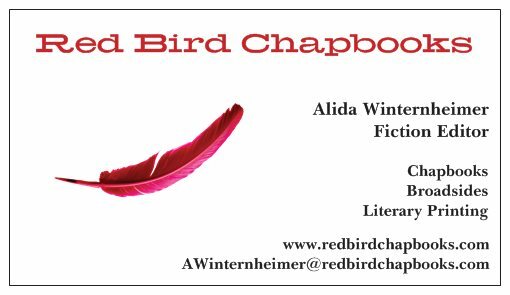 Red Bird Chapbooks is an incredible cottage industry press that is growing fast, and I am really really excited to be the new Fiction Editor. I expect great things to happen with this press and you should keep your eye on us! Besides chapbooks of poetry, fiction, and creative nonfiction, Red Bird has a Broadside Project that beautifully pairs art and words. Check out the Possibilities page and send us your best work. At Red Bird Chapbooks, the marriage between form and content equals a visual/textual work of art.